And roll away the reel world, the reel world, the reel world! So says James Joyce in Finnegans Wake, thereby giving a handy headline for anyone producing anything relating to Joyce and film, something which has grown as a subject of scholarly interest in recent years. 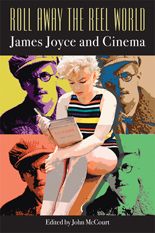 Its most recent expression is Roll Away the Reel World: James Joyce and Cinema, a collection of essays edited by John McCourt and published this month by Cork University Press. The book brings together talks given at last year’s conference, exhibition and film festival on James Joyce held at Trieste in Italy, which the Bioscope reported on at the time. The book includes an essay by myself on James Joyce’s management of the Volta cinema in Dublin December 1909-January 1910 (Ireland’s future literary giant was looking for a get-rich-quick scheme and thought that cinema management was the answer. It wasn’t). 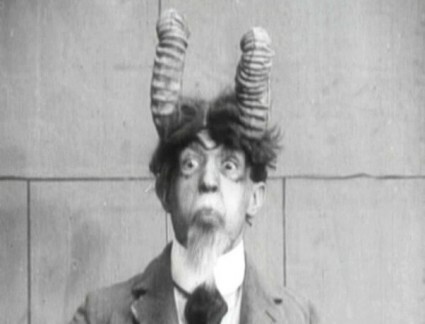 I’ve also contributed a filmography of all the film shown at the Volta from December 1909 to mid-April 1910, previously published in an obscure Irish journal and now updated and now a lot more accessible for the assorted Joyceans who have been emailing me for years now in pursuit of a copy of the original list. There is more on silent cinema in the book, which makes it worth seeking out for anyone interested in the relationships between early film and literature. Indeed it is exciting to see how very well the current generation of literary scholars engage with both media. Erik Schneider writes on the history of the Volta from the Trieste angle (Joyce teamed up with some Triestine businessmen to launch the Volta initiative); Katherine Mullin writes on “Joyce, Early Cinema and the Erotics of Everyday Life” (on Edison, Biograph and peephole movies); Maria DiBattista and Philip Sicker each write on Georges Méliès in “The Ghost Walks: Joyce and the Spectres of Silent Cinema” and “Mirages in the Lampglow: Joyce’s ‘Circe’ and Méliès’ Dream Cinema” respectively; Carla Marengo Vaglio looks at a joint music hall and cinema relationship in “Futurist Music Hall and Cinema” while Marco Camerani explores the stage performer-turned-film perfomer angle further with “Circe’s Costume Changes: Bloom, Fregoli and Early Cinema”. And other writers carry on the argument into the sound era, from John Huston to Jean-Luc Godard to Mel Brooks. The BFI National Archive has put together a compilation of the Volta films it holds (the BFI holds the majority of the surviving films known to have been programmed at the Volta). This is available to researchers able to get to its central London site (do book ahead, as with all BFI viewings). If you want live music accompanying the films and me burbling on about the history, then come to Glasgow.